To see from Olive Branch: From the intersection of Hacks Cross and Hwy. 78 go 3.5 miles to the Ingrams Mills exit. Go south on Red Banks Road for 2 miles and turn left of Fairview Road. Go east on Fairview Road for 2 miles and see the new road on the right at the Marshall County line. Note: On the way you will pass a farming operationcalled Fairview Farms and a subdivision called Fairview Trails. We are Fairview Road Farms. This subdivision is restricted to homes with a minimum of 1,200 square feet of heated space. Double-Wide and modular homes are allowed only on tracts sold prior to December 31, 2005. On all sales made after that date, only conventional homes are allowed. Other restrictions prohibit junk cars and other noxious uses of the property. 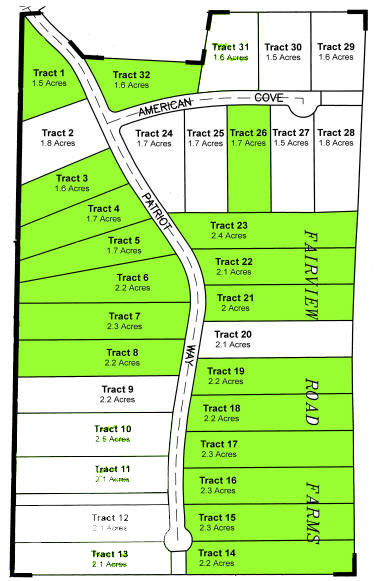 There are two 1.5-acre tracts on Vinson Road on which double-wide homes are permitted, $19,995 each.